The Dow hit a record high right out of the gate on Wednesday and that’s got investors wondering if there’s a correction lurking in the wings. With all the political turmoil at hand over healthcare, taxes, and more, many are rightly concerned that a downturn could set them back years. What they’re missing is that times like the present are loaded with pure, unadulterated profit potential. …if you understand the Total Wealth Tactic I’m going to share with you today. Before I tell you what it is, though, let me say that the tactic we’re going to discuss right now is one of the most powerful of all the Total Wealth Tactics we’ve got at our disposal. What’s more, it’s so simple anybody can use it to boost returns and reduce losses – in 90 seconds or less. That’s about how long it will take you to “rebalance” your portfolio. If you’ve just joined us, rebalancing is one of the single most powerful yet easy to use Total Wealth Tactics available to individual investors today. Simply put, rebalancing is a strategy that ensures your money is working the way you want and, perhaps most importantly, that every dollar you have in the markets is aligned with your individual risk tolerance, objectives, and financial aspirations. Not Wall Street’s. Let’s say you have a $100,000 portfolio that’s invested 50%-40%-10% in stocks, bonds, and speculative investments, respectively. That means you’d have $50,000 in stocks, $40,000 in bonds and another $10,000 in speculative investments. A year from now, let’s suppose that stocks have appreciated 10% and bonds have lost 12% because the Fed got aggressive. Let’s also say you hit the big time with your speculative play and that it’s up 100%. That means your $100,000, 50-40-10 portfolio would now be worth $110,000 and the allocation would be more like 50%-31.8%-18.2%. To get back to your targeted 50-40-10 risk profile, you’d rebalance by selling $9,000 worth of your speculative investments and buying a corresponding $9,000 worth of bonds using the proceeds, assuming you had no new money to invest. This is where most investors go off the rails. They don’t see a problem with letting their winners “ride.” That’s fine if you’re in a Las Vegas casino and want to leave your money on the table even as you continue to bet you won’t lose it, but that strategy is totally unsuited to today’s financial markets. Every dollar you earn if you don’t rebalance means you’re taking on more risk. 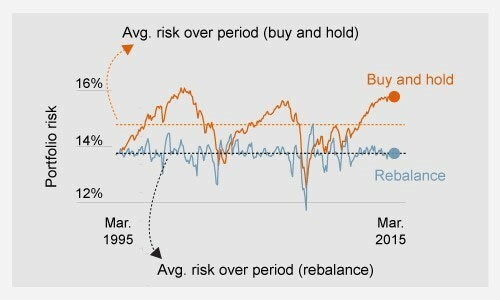 Figure 1 – Fidelity InvestmentsThis is where many investors found themselves coming into the Dot.bomb crash of late 1999/2000 and the Financial Crisis of 2008. They thought they were doing great. What they didn’t realize was how concentrated their risk was becoming… in the very stocks that were making them gobs of money. You can see that very clearly in orange. Note how much higher the risk associated with letting things ride became in 2000 and in 2007… right before the bottom fell out and they got shellacked. Contrast that with the much lower risk of a constantly rebalanced portfolio in blue. Invest for one day and you’ve got approximately a 54% probability of making money in the stock markets. Invest for a year and that number jumps to around 68%. But leave your money alone for a full decade and the probabilities rise to a smile-inducing 87%, according to Dan Wiener and Jeff DeMaso of the Independent Advisor for Vanguard Investors, who based their analysis on returns from 1927 to 2014. So let’s re-run those numbers assuming you’re going to add an additional $10,000 to your investments as you rebalance. That means you’ll be buying $5,000 more stock, buying another $13,000 worth of bonds and selling $8,000 worth of speculative investments to get back to your perfect 50-40-10 portfolio allocation. Again, the thinking here is pretty simple. Rebalancing ensures you are capturing profits and buying more of whatever’s on sale. Over time this can significantly reduce portfolio volatility AND boost your returns. There’s extensive research showing that the advantage can be anything from a few percent a year to 300% or more over time. The answer, like many things, depends on your personal circumstances, the time you leave your money invested and in how you’ve allocated it. But, and this is very important, the principles are the same no matter how much or how little money you have in play. 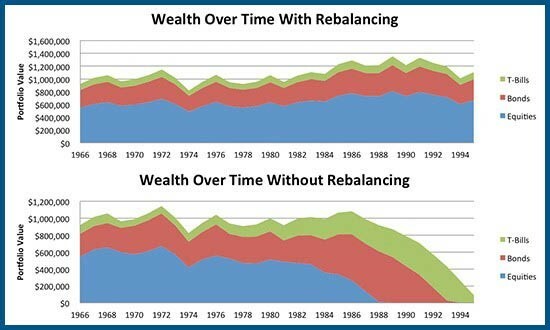 That’s why rebalancing is so very important to understand and to get right. Here’s a study from Forbes highlighting the performance of two hypothetical $10,000 portfolios starting in 1985 and ending in 2010. Both use a 60/40 mix of stocks and bonds based on the S&P 500 Index and the Barclays Aggregate Bond Index. The only difference is that the blue portfolio was rebalanced annually while the orange portfolio was never rebalanced. As you can see, the rebalanced portfolio was worth just over $97,000 at the end of the study. That’s a total return of 870%. The un-rebalanced portfolio was worth only $88,980 and resulted in a total return of 789%. Here’s the real kicker, though. Let me show you what can happen when you don’t rebalance. 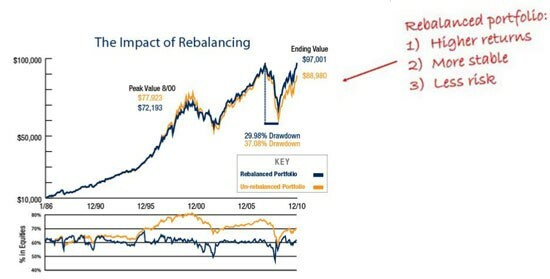 Put very bluntly, not rebalancing periodically is so damaging that it can lead to dramatically worse results over time even if there are other investment decision rules in place, according to my research and that of Michael Kitces, a partner for Pinnacle Advisory Group, a private wealth management firm overseeing more than $1.8 billion of client assets. For one thing, there’s more than one way to rebalance. I’ve highlighted a simple percentage-based method today, but you could introduce variables related to trade risk, trading method, parity, or any number of other institutional grade concepts if you wanted. For all but the most sophisticated individuals, that’s overkill, though. The key to rebalancing successfully is to: 1) use predetermined thresholds like the 50-40-10 portfolio I advocate in the Money Map Report and 2) rebalance consistently when it gets out of line. For another, there’s a lot of debate about how often to rebalance. I think keeping things simple is easiest and most effective. Very few investors have the discipline needed to realign their holdings monthly or even quarterly. That’s why I’m a big fan of picking a date you’ll remember like your birthday and rebalancing annually. There can be tax considerations, too. That’s why, if possible, you want to rebalance within retirement accounts or using tax advantaged investments to avoid paying Uncle Sam any more than you legally have to. Even further, you can always work with a financial advisor or accountant to combine rebalancing with tax smart moves that pair gains with losses that are then applied against realized capital gains or ordinary income. In closing, let me leave you with a thought. There are a lot of people who believe that the markets are at record highs right now and that, therefore, there’s nothing to buy. The risks of a correction are mounting which is exactly why you want to rebalance and why doing so can be so very powerful. Besides, should a correction hit, you’ll know exactly what to buy no matter what happens next. And, exactly how much, too. Hello, Keith. I have a question regarding selling to lock in profits with regards to a correction. I purchased a stock in 2016 that went from $36 to $129 in 10 months. Then it began to drop and I sold a 30% position at $98. Still, a great gain. Then the stock price proceeded to rise to $169 over the last 8 months. I am glad that I didn’t sell my entire position or I would have missed this rise. So my question is: even in view of a 5% correction should I sell or ride it out until the next wave?